If you selected ‘D’, congratulations! Scroll past this artsy poster to read more about the answers to this quiz. 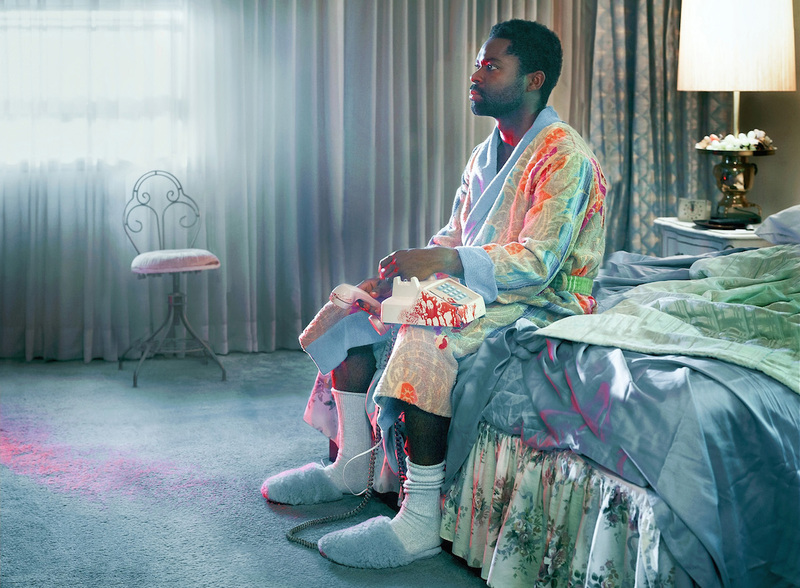 This entire film focuses on what’s happening to Peter Snowden (Oyelowo) in present time. There are no flashbacks and no scene of enlightenment to explain Peter’s past and how it shaped him into his current state of mind. There’s a vague mention that Peter may have suffered a tragic event while serving in the Iraq War, and he repeatedly insinuates that his mother is overbearing and judgmental. You may wonder what the mom is judgmental about, and it brings us to a main focus of the film. Peter wants to bring a war buddy over for dinner, but Mom is not having it. Her house, her rules. The film becomes very unsettling within the first 5 minutes. Peter works an hourly job and lives with his mom, but he immediately gets her out of the way. (See picture below.) And believe it or not, things go downhill from there. The viewer is trapped in a house with Peter and his thoughts, his paranoia, his rage, and his depression. It’s draining and terrifying with no relief. Peter never has a physical interaction with any character, and he only communicates by phone so occasionally we will hear another person’s voice but we never see their face. We do see Peter’s reactions as he becomes agitated with Mom’s friends who want to come over and make sure she’s okay. He is frustrated when he calls his war buddy’s phone – again and again – to arrange a dinner only to be intercepted by his buddy’s wife. Peter isn’t deterred though, and he spends an insane amount of money to spruce up the house before the Dinner That Will Never Happen. If you learn one thing from this film, just remember to never upset a crazy person. 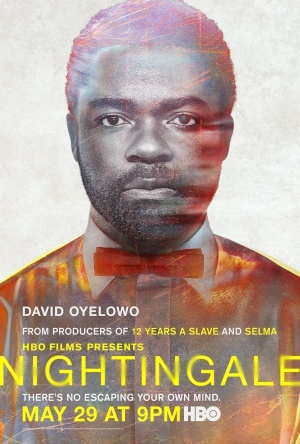 Another thing to learn is David Oyelowo is a fantastic actor. This seems to be a gutsy role that most actors would love to take a chance with. Oyelowo showcases a wide range of emotions and body language and it’s all very impressive. My only gripe is the length of the film. Even though 82 minutes is pretty short, I think an even 60 minutes would’ve been enough. Nightingale almost plays out as a Twilight Zone episode, except there’s no clear beginning or end and Rod Serling doesn’t serve as a narrator. The upside is you don’t have to block out an entire afternoon or evening to watch this film, so if you get a chance to watch it please let me know what you think!